We get it—looking and feeling good is important, whether beauty treatments relax you or give you a healthy confidence boost. However, if you’re not careful, the lengths you go to look good can make you sick. While a manicurist or waxing specialist may not seem like a medical professional, the truth is that a salon mishap can be just as dangerous as a botched procedure or misdiagnosis. Handled improperly, these beauty rituals can spread infections and diseases like hepatitis C, MRSA and even respiratory disease. 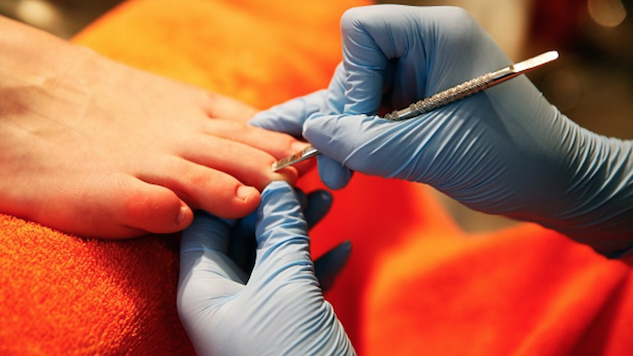 The abrasive metal tools used in pedicures sometimes cause bleeding, and if they’re not sterilized between use, can transfer blood-borne illness to other customers. Pedicures are particularly notorious for spreading hepatitis B and C, which can develop into deadly cirrhosis or liver cancer. Many nail salons fail to meet sterilization protocol, so to stay safe, bring your own equipment (that you also sterilize) or give yourself a pedicure at home. If you have an infection or wound such as a cut or blister on your foot, you shouldn’t be getting a pedicure anyway. Sterilized or not, the hot water and chemicals can increase pain and worsen the infection. The blue cleaning solution used at some barber shops doesn’t fully sterilize scissors and razors, tools that are occasionally exposed to blood. As with pedicures, shaving and haircuts can spread disease, most notoriously hepatitis B and C, if the tools used aren’t clean. Anything that nicks or breaks the skin can put you at risk, so verify that the materials are being properly cleaned or start doing the job at home (additionally, this is why you should never share a razor). Waxing treatments are known to cause rashes and burns, but double dipping—that is, putting a wooden spatula back into the wax pot after it’s been used—poses a much more serious threat. If a spatula is being recycled, think about where it’s been. Many people who contract STDs like chlamydia and gonorrhea don’t know it, especially if their symptoms are still dormant. The tainted wax acts as a vehicle, spreading the disease to unsuspecting customers. Depending on where people get waxed, they can develop infections on their face or even in their armpits. You know how a public pool (or any pool, for that matter) gets gross if it isn’t cleaned properly? The same goes for hot tubs, which can be hotbeds for recreational water illnesses (RWIs), which people can pick from contact with contaminated water in public areas. Depending on how you interact with contaminated water, you can pick a number of diseases—accidentally swallowing water usually results in gastrointestinal maladies, notably diarrhea, while breathing in contaminated mist exposes you to Legionella, which can develop into a form of pneumonia called Legionnaires’ disease. People are already aware of the ties between tanning beds and skin disease, but there’s also a risk of developing a staph infection, which can lead to amputation or even death. Staph usually spreads through the nose or skin, which happens to make a lot of contact with tanning beds. Staph bacteria can survive on inanimate objects or surfaces for 24 hours, and if a contaminated tanning bed isn’t properly sterilized, whoever gets in next is at risk. Sarra Sedghi is Paste Food’s and Paste Science’s assistant editor. Her gastroenterologist father’s tales of patients catching hepatitis from nail salons have frightened her for at least a decade.